> Research Library > Sprinklr > Analyze This: Marketing technology analyst reports and your day job. They're not just for RFPs. Analyst reports can help you work smarter. Yes, analyst reports like the Forrester Wave™ are the go-to source when you need check out top vendors (and we're proud to named a Leader consistently). But, those reports offer so much more. The trends the researchers uncover can help you broaden your marketing knowledge for greater success. 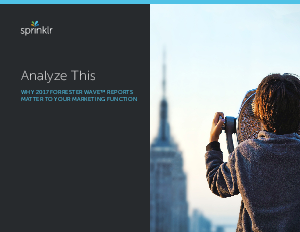 In “Analyze This”, we look at the key takeaways from several recent Forrester Wave Reports and provide some additional guidance and market information.